The Amaranthine Series is my current project. 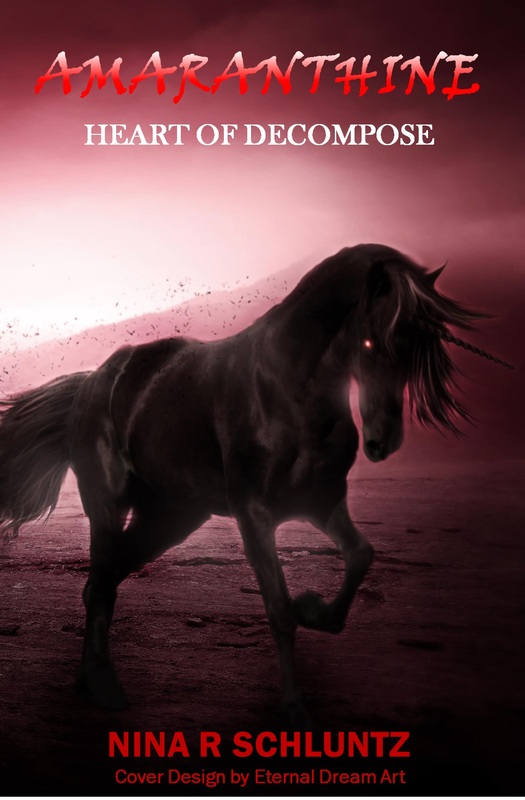 I finished the first book, Amaranthine: The Heart of Decompose, during the summer of 2013. A new edition was released May 2015. If you want to do a review for the novel, please contact me and I’ll make arrangements. At the center of it all stands Dee, a man immortalized in legend as Decompose. An ongoing war between unicorns and dragons has led to the creation of a plague… a deadly infection Dee is the host for. Not quite human, but not a unicorn either, Dee and the plague form a symbiotic relationship, resulting in immortality of the undead kind. The Gold Dragon, the most powerful of the Wyverns, sets into motion the events needed to end the Wyvern-Alicorn War and bring about the legendary Triple Twilight. This event is rumored to bring peace to the galaxies, and sate the legendary Decompose who spreads deadly plagues. The key to success lies with a woman who has spent her entire life as an assassin, hunting magical creatures who impose their will on lesser beings—a definition that both the Gold Dragon and Decompose fit. Success seems within the dragon’s grasp, but the encroaching Triple Twilight creates new desires in Decompose that even the Gold Dragon did not foresee. The vaporous alien, Santa, has manipulated time for thousands of years. On the day he acquires the orb that makes his time traveling abilities possible three suns will set in the sky. The famed Triple Twilight, foretold to bring peace to the newly declared god, Decompose, also begins the countdown to the day Santa has seen himself die. To save himself would doom all to the wrath of Decompose—cursing the land to plagues of undead creatures. An assassin who has spent her entire life hunting magical creatures is Santa’s only hope to avoid his fate.